The United States Department of Defense has announced a restructuring of operations in Europe, including the closure of 15 American bases that will be offered over to host nations. The consolidation of US bases and posts around Europe will save about $500 million per year, according to the Pentagon, and result in a net decrease of about 2,000 US military and civilian personnel across the UK. More than 74,000 troops are based in Europe, according to US European Command figures. Several US military facilities in Germany will close, though overall US troop numbers there are expected to increase by a few hundred, Reuters reported. Italy will gain about 300 US personnel. Around 500 US personnel will be withdrawn from Lajes Field in Azores, Portugal. As RT reported, the Pentagon will divest from Royal Air Force Mildenhall near London, withdrawing 3,200 military personnel over the next several years. Yet, by 2020, two squadrons of F-35 Joint Strike Fighters and 1,200 personnel will be added to Royal Air Force Lakenheath. The move comes amid the Pentagon’s orders to cut expenses by nearly $1 trillion over a decade amid expensive military ventures in Iraq and Afghanistan – though the cuts are not nearly enough to displace the US as the world’s top military spender. Pentagon officials stressed Thursday that the European Infrastructure Consolidation (EIC) project will not diminish US military might in Europe, an operational hub for actions taken in the Middle East and North Africa. “We are consolidating and reducing some existing support infrastructure in order to be more efficient, but we are not affecting our operational capability,” Derek Chollet, assistant secretary of the US Department of Defense for International Security Affairs, said. 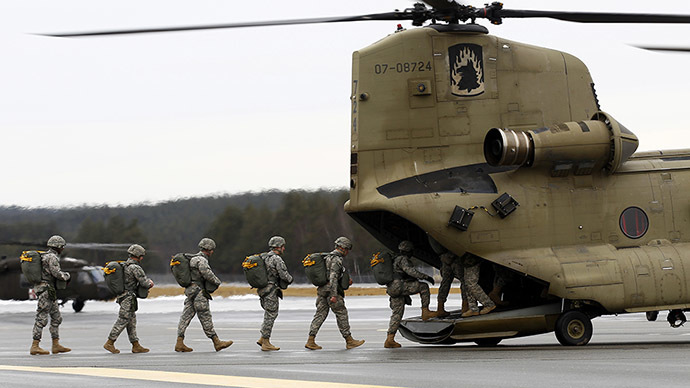 The Pentagon has sought to close bases in the US in order to save billions of dollars annually, yet lawmakers in Congress have repeatedly blocked any such efforts to avoid potential losses of military jobs in their districts. Congress has pressured the Pentagon to look overseas for cuts to the military’s operational budget. The European closures, which will take as many as six years to complete, will not need congressional action, Bloomberg reported. Meanwhile, Congress has already approved a $985 million European Reassurance Initiative to boost facilities, regional training, and overall military capabilities of allies in Eastern Europe and nations such as Ukraine. The increased funding was offered amid tensions in the region between Russia and NATO nations led by the Western-backed government takeover in Ukraine that deposed Russian ally President Viktor Yanukovich nearly one year ago. A tentative ceasefire is in place between the two sides, which are distinguished by loyalty to the new government in Kiev or the self-proclaimed Donetsk and Lugansk People's republics in the east.